Special thanks to Black Kettle for extending this food review invitation. Black Kettle is located at the busy crossroads of Beach Street (Lebuh Pantai) and Chulia Street Ghaut (Gat Lebuh Chulia). Since my previous visit, the restaurant's facade has been repainted yellow to commemorate the rebirth of Black Kettle. Recently on board to reinvent Black Kettle is celebrity chef James Won. Chef James is the curator of Enfin By James Won, a fine dining French restaurant in Kuala Lumpur. With extensive culinary experience in several Michelin Star restaurants, Chef James has undertaken an extensive makeover of the menu. 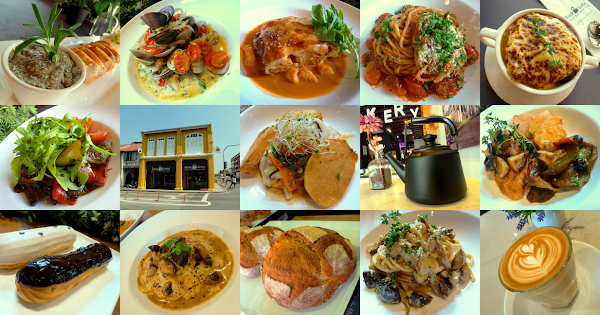 The new Black Kettle specializes in French-European cuisine with occasional infusion of local flavors. Favoring quality over quantity, the new menu takes a simplified approach where food is entirely prepared from scratch. At the helm of the new kitchen is Chef Fabrizio Littera, a veteran in European culinary arts. Soup Du Jour (RM14.00) is French for "Soup Of The Day". There are two types: Carrot Ginger Soup and Cauliflower Soup. The former is available today. Meanwhile, the French Onion Soup (RM18.00) is made from chicken stock and onions. As per tradition, the top surface is gratinéed with croutons and cheese. Black Kettle menu incorporates a number of vegetarian dishes such as salads. One such dish is the Garden Salad (RM12.00) - made from rocket salad (arugula), garden herbs, parsley and cherry tomatoes. Balsamic reduction and olive oil serve as dressing. Alternatively, one can also try Grilled Vegetables (RM22.00). Besides having rocket salad, this dish comprises of grilled bell peppers, eggplants, cherry tomatoes, potatoes and sweet potatoes. A dash of balsamic reduction helps to helps to draw appetite. The next dish is Caesar Salad (RM22.00), which is cleverly presented over individual sheets of romaine lettuce. The topping is a mixture of salted fish, egg, garlic and chopped parsley. Parmesan cream cheese, beef bacon and crouton crumbs are presented on the side. There are several interesting entrées on Black Kettle's menu. An entrée is a dish which is customarily served before the main dish. It is important to note that in the United States, the word "entrée" refers to the main course itself. Bread & Dip (RM12.00) is an entrée (non-American terminology) which features mushroom pâté and hummus. Both are made from scratch and are to be used as bread spread. Several slices of baguette, fresh from the bakery, are provided for this purpose. Grilled Mackerel (RM12.00) is topped with chopped parsley, lavender and honey dressing. The appearance and taste are similar to carpaccio. Wild rocket and cherry tomatoes are served on the side. If you have an affinity for shellfish, The Clam Pot should serve you well. The clams are cooked in rich broth that infused with white wine. While the clams are indeed fresh, I am more fascinated by the gratifying broth. This entrée is available in two sizes: 300 grams (RM18.00) and 600 grams (RM32.00). Yet another vegetarian dish is Pasta Ala Pomodoro (RM19.00). This pasta takes full advantage of freshly made tomato sauce and cherry tomatoes. To improve flavor, the spaghetti is sprinkled with grated parmesan cheese and chopped parsley. Optionally, the pasta can be enhanced with extra ingredients such as smoked salmon (RM8.00) and sautéed mushroom (RM5.00). You cannot go wrong with Cream Of Mushroom Pasta (RM19.00). Three types of mushrooms are used here: shiitake, button and oyster mushrooms. The mushrooms are extremely fresh indeed. Blending seamlessly with creamy dressing, the pasta is one of my favorite dishes here. Heh Bee Pasta (RM19.00) is a fusion dish that Chef James created to incorporate elements of Penang cuisine. Dried shrimps (虾米) impart appetizing aroma as soon as the dish hits the dining table. Another unconventional ingredient, cili padi (bird's eye chili), also helps to spice things up. Baked Pasta (RM19.00) consists of interleaving layers of macaroni and sauce, giving it an unmistakable resemblance to lasagna. The dish is served with creamy marinara sauce and is best consumed while it is still warm. I believe that most locals will be delighted to try the Baked Rice (RM19.00). Covering the rice are chicken breast and creamy mixture of béchamel sauce, mushroom, parmesan cheese and mozzarella cheese. The rice's soft texture bears some resemblance to risotto. Although, the Baked Rice carries mild pungency from peppercorn, you can up the ante by going for the spicy version. The use of dory fish of carries negative connotation, but my prejudice is dispelled with this serving of Fish & Chips (RM19.00). According to Chef James, the secret lies with the breading. Taking advantage of fresh in-house bread, the chef uses bread crumbs mixed with parmesan cheese to produce the breading. I cannot recommend this dish highly enough. Poisson En Papillote (RM25.00) means "fish in parchment". This is in reference to the way tilapia is cooked. The fillet is sealed in a paper pouch and baked. This method of cooking allows the fish be cooked by its own moisture, accentuating the tilapia's natural flavors. In addition, I am also very impressed with the lovely texture of baked potatoes. Switching gear to poultry, the BK Chicken Chop (RM19.00) consists of a piece of deep-fried chicken thigh served with fresh tomato sauce, mushrooms, green peas, carrots and corn. The dish also includes a fried egg and baked potatoes. Inspired by Provençal cuisine in southeastern France, Provencal Chicken (RM25.00) is served with ratatouille. Ratatouille refers to a traditional French recipe of stewed vegetables such as bell peppers and black olives. The dish also makes liberal use of shiitake and button mushrooms. Delectable wedges of baked potatoes are served on the side. Meat-lovers may want to get their hands on the Lamb Shank (RM28.00). The lamb is braised gently such that the flesh turns soft. Flavored with tomato sauce, the lamb shank is pleasantly juicy and aromatic. Baked potato, carrot, celery, shallots and button mushrooms accompany the red meat. The bakery section features a dozen types of bread that have been leavened by levain. Levain is the French term for flour that has been colonized by yeasts and bacteria. The levain culture used at Black Kettle is specially supplied by Chef James' renowned restaurant in Kuala Lumpur. Champagne Loaf (RM16.00) is also known as French sourdough. The bread does not contain actual champagne; the name refers to the French phrase "pain de campagne", which means "country bread". Made from a mixture of wheat, rye and bread flours, the bread is extremely fresh and satisfying to my palate. Flax Seed Cranberry Loaf (RM25.00) is dotted with flex seeds that provide grainy texture. Combined with fruitiness of cranberries, the bread can be eaten plain, or with olive oil and balsamic vinegar. Éclair (RM4.20) is an oblong pastry that is filled with sweet custard (crème pâtissière) and is typically covered with frosting. The word "éclair" means "lightning" in French, presumably because this finger food is meant to be eaten quickly. There is also Passionfruit Éclair (RM4.20) which has icing sugar glazing. However, my personal preference goes to the original version. As part of Black Kettle's rebranding campaign, the selection of coffee has also been revamped. Black Kettle Coffee is now supplied by Degayo. Operating its own coffee plantations in Indonesia, Degayo manages the entire processing pipeline from harvesting to packing. Exclusive to Black Kettle, the House Blend is a combination of Sumatran and Javanese beans. Meanwhile, Degayo Natural Single Origin uses light-to-medium roast and has a distinctive berry-esque fruitiness. Drip brewing is recommended to truly appreciate the bean's characteristic flavor. Two types of coffee filter are available: paper and metal. The former absorbs essential oils to some degree, resulting in a clearer brew but not quite as aromatic as the latter. Besides espresso-based drinks like Latte (RM10.00), Black Kettle also serves tea, juices, milkshakes and more. Alcoholic drinks will be introduced at a later date. According to Black Kettle, the food menu will be expanded in phases over the next couple of months. Despite its emphasis on premium ingredients and fresh food preparation, Black Kettle maintains affordable pricing in order to appeal to a larger clientele. The proprietors also dropped hints that Black Kettle will be opening a new restaurant and boulangerie in adjacent shops later this year. The goal is to establish this section of Beach Street as an F&B and entertainment hub. Directions: Black Kettle is located at the intersection of Beach Street (Lebuh Pantai) and Chulia Street Ghaut (Gat Lebuh Chulia). Street parking is available along both streets.